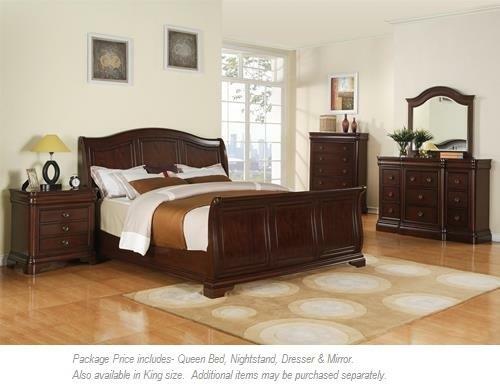 The Cameron 4PC Queen Bedroom by Elements International at Miskelly Furniture in the Jackson, Pearl, Madison, Ridgeland, Flowood Mississippi area. Product availability may vary. Contact us for the most current availability on this product. Drawer Suspension Full extension glides, and built in drawer stops. Drawer/Shelf Construction French and English Dovetail connections. Felt-lined top drawers. Handles & Hardware Large round knob hardware with screws. Case Construction Solid and engineered wood framing. Panel feature birch veneers. Dust proofing on case bottoms. The beautiful Cameron bedroom set features graceful lines and elegant details for a calming retreat from the outside world. Each piece is finished in a rich brown hue to enhance the classic, transitional style. Organize your space with the large bedroom storage pieces finished with subtle tiered edge moulding and large round knobs. 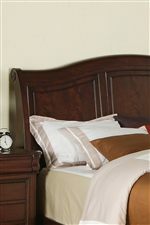 Complete with the impressive sleigh bed for the timeless Cameron experience. The Cameron collection is a great option if you are looking for Transitional furniture in the Jackson, Pearl, Madison, Ridgeland, Flowood Mississippi area. 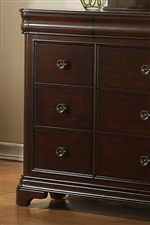 Browse other items in the Cameron collection from Miskelly Furniture in the Jackson, Pearl, Madison, Ridgeland, Flowood Mississippi area.